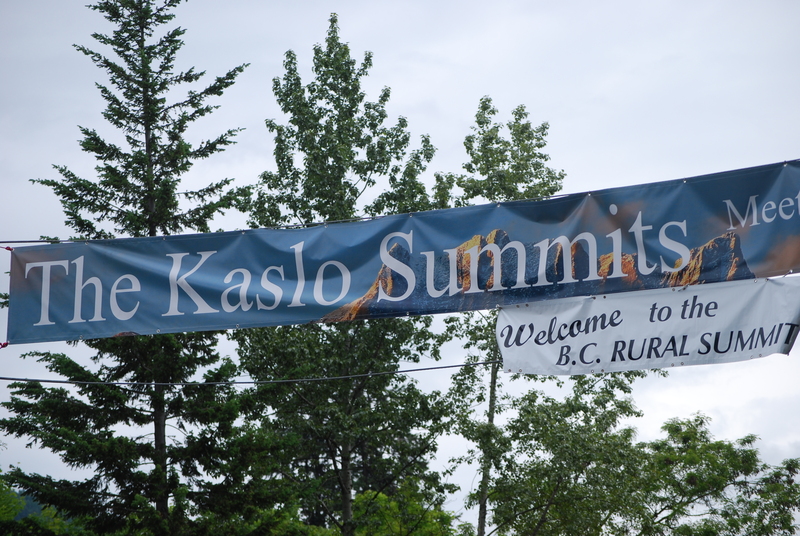 Kaslo’s Rural Summit a Success! Wow. What a wonderful weekend! For three days Kaslo was the centre of BC’s rural universe (and a rather large universe it is), as the Kaslo Institute hosted the 8th biennial BC Rural Summit. Folks from all over Canada’s westernmost province, and from as far afield as Serbia and Los Angeles, gathered here in our charming village to chat, listen, debate, network — and enjoy themselves. We put together a Summit program that covered topics ranging from the importance of food security and protected watersheds, to rural broadband and the need for strengthened rural healthcare. The Institute ensured that the crucial role culture and technology play in sustaining (and ensuring the viability) of rural communities ran throughout the entire proceedings. Summit sessions on art and animation, what amenities attract people to rural settings, and how culture can both enrich the inner lives of rural citizens as well as boost local economies, were complemented by a free public talk at the Langham Theatre by one of the world’s leading animators, John Kahrs, who screened his Oscar-winning film, Paperman before an appreciative audience of Summit delegates and Kalsovians. We scheduled John into the Langham (he led a Summit session the next day) coinciding with the launch of Kaslo’s Art Walk precisely because we wanted to underscore the importance of art generally, and remind everyone that art can — and does — serve as a significant economic driver, creating massive direct and indirect benefits for the communities in which art creation occurs. Toss in performances by talented, enthusiastic local musicians over the three days of the Summit, posters featuring local artists’ work, and truly spectacular food (culinary art) prepared by terrific local chefs, and delegates came away mightily impressed by creative Kaslo. A much more detailed report on the Rural Summit will follow, once we’ve put together all our notes, photos, and videos — as will individual blogposts stimulated by ideas raised during the proceedings. For now, suffice it to say the Summit was a smashing success! We heard nothing but praise from attendees, who were delighted with the scope and quality of the proceedings, and blown away by the friendliness, beauty, and culture they encountered while with us. We look forward to welcoming many of our visitors back to further explore all that Kaslo and the North Kootenay Lake region have to offer. Huge thanks to all those who helped make this first of many Kaslo Summits (next one up: A Gathering of Words, a week-long celebration of the written word, July 21-27) — including the Village crew who hoisted up our 37′-long Kaslo Summits banner in record time! A special tip of the hat to our fellow rural residents, BCRN’s Maureen, Donnella, and Jane, for all their hard work, good humour — and impressive dance moves! Oscar Winner Coming to Kaslo!